Shortly after waking and before eating or brushing your teeth, this extraordinary oil can be swished around in the mouth and spit out to """"pull” bacteria and other toxins from the body. ️To use, simply place approximately 1 tablespoon of GuruNanda Pulling Oil in your mouth and gently swish, pushing the oil between your teeth and around your mouth for 2 to 3 minutes. For better results you may gradually increase the time period up to 15 minutes as long as it is comfortable. ️When the oil begins to feel watery or if you start having jaw or neck fatigue, spit it out. Wash your mouth thoroughly with fresh clean water and then brush your teeth with a toothbrush and toothpaste. ️While you are pulling, mucous may build in the back of your throat. You may even have to expel the oil and clear the mucous from your throat before reaching your desired duration of pulling. If this occurs, use more GuruNanda Pulling Oil and continue pulling until you have hit your total pulling time. With frequent use, gradually increase your pulling time up to 15 minutes. You must brush your teeth after you pull oil as oil forms a biofilm on top of teeth. As a result, microorganisms can get trapped between the biofilm and teeth, which can create dental issues. ️Most importantly, the pulling oil should not be swallowed as it contains the very toxins and bacteria you are trying to eliminate from your body. ️Oil pulling is best performed in the morning before consuming any fluids or food. Results may vary depending on the frequency of use. Although relief is very different with individual people, users may see substantial results in as little as 6 weeks. GURUNANDA Oil Pulling was formulated with ayurvedic knowledge to promote healthy weight management, better breath, healthier teeth and gums, thicker and more lustrous hair, and radiant skin. 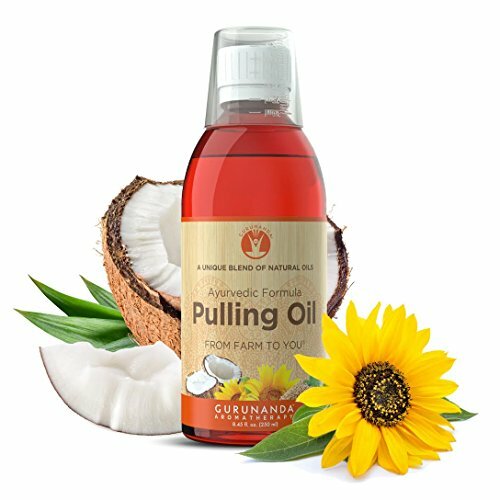 Oil pulling is a unique oral detox methodology with a long, rich history in Ancient Indian Ayurvedic medicine that dates back more than 5,000 years. Made in the U.S.A.
Oil pulling helps increase saliva secretion and traps toxins within the oil's particles. With oil pulling, you can use the salivary glands in your mouth as a detoxifying organ. GuruNanda Pulling Oil is perfectly balanced combination of pure sesame oil, sunflower oil, coconut oil and peppermint oil. Our Pulling Oil is formulated with Vedic knowledge and Modern technology. GuruNanda Pulling Oil is 100% alcohol-free and contains no artificial flavors or colors. Our Oil is rich in Omega-3 fatty acids and contains iron, calcium, and magnesium, plus Vitamins A, B and E.
If you have any questions about this product by GuruNanda, contact us by completing and submitting the form below. If you are looking for a specif part number, please include it with your message.